Every car may come with headlights, but if you want to really see what your car can do, it is time to invest in aftermarket car headlights. These car headlights offer a wide range of perks, which can not only light up the road but vastly improve your overall driving experience. When thinking about aftermarket car headlights, you should first understand the advantages. Car HID lights and car LED lights are two of the most popular options. Each of these car headlights offer superior visibility during night driving, which is especially important for performance. 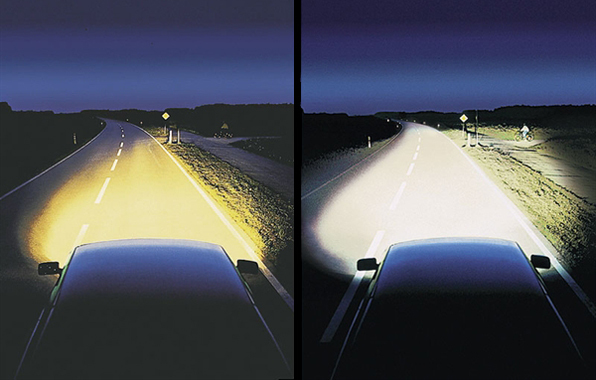 With these aftermarket car headlights, you will have a wider field of vision at night, and more things will be visible on the road. This not only enhances your driving experience but improves your reaction speed. LED lights are particularly effective in this manner since the light produced by such bulbs is directional, which means it does not diffuse as quickly. To read more about headlights, please follow this link to our blog about Car Headlight Installation. HID, Halogen or LED. More than that, car HID lights and car LED lights are also more efficient, which makes them cost effective options. In most cases, HID bulbs, which are also known as Xenon lights, will last 10 times as long as standard halogen bulbs, which means these car headlights are easy on the environment and your wallet. Although halogen bulbs are less effective than HID and LED, they are still widely used because they are cheap and easy to replace. Joe’s Car Stereo is well equipped to handle all aftermarket headlight installation. With more than 10 years of experience, Joe’s Car Stereo has worked with vehicles of all sizes, types and ages. As a certified business, Joe’s Car Stereo is a reputable choice with fully certified technicians, and service comes with a full manufacturer’s warranty. In addition to LED, HID and halogen bulbs, Joe’s Car Stereo can also install LED tail and brake lights, fog lights, truck lights and LED interior ambiance lights. Although Joe’s Car Stereo can work with all brands, the most popular options include Xenon HIDs, Can Bus HIDs and Race Sport. With this range of expertise, Joe’s Car Stereo can revitalize the lighting system in any car or truck. To learn more about the quality work performed by Joe’s Car Stereo, please visit our previous work gallery. Every car may have headlights, but if you want to illuminate your best driving experience, contact Joe’s Car Stereo for information about aftermarket headlight installation today. LED lights are particularly effective in this manner since the light produced by such bulbs is directional, which means it does not diffuse as quickly.